Self Defense Cap with hidden weight. The Sap Cap is your standard type baseball cap, but with the added ability to be used like a blackjack or sap. Just use the bill as the handle and then use the cap as an impact weapon. 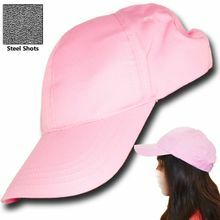 This covert self defense cap has a bag filled with steel bird shot sewed into the back of the hat,converting a regular baseball hat into a self defense weapon. While unlikey to cause serious harm, it may be useful as a distracting and troublesome agent when used against an attacker. It would be a surprise to have you whip off your cap and bash it in the face or your opponent when they do not expect it. It would be an effective move to gain the upper hand. Color: black or pink or red with spiked knuckle. One size fits most.